2008 is now over and what an incredible year it was! I’d like to thank all of the Friends involved in HM1, HM2 and HM3 for doing a phenomenal job: we not only achieved, but overtook, every single one of our objectives for the year. And here we are at the beginning of 2009 looking forward to yet another year of exciting creations, amazing developments and impressive craftsmanship. In this first newsletter of 2009 we feature the stunning new HM2-Ceramic, which was recently unveiled to the public, and we reveal the first of our "Auxiliary components". Our website has been receiving an ever increasing number of visitors, no doubt drawn by the fact that it is continuously updated with new creations, featured articles In the Press, plus of course our weekly posts on a diverse range of subjects in A Parallel World. Whenever you have a free minute, please do not hesitate to drop in and browse around. Ceramic: there is nothing quite like it. In fact, nothing even comes close! From exquisite 5,000 year old pottery to 300 km/hour brake disks on Formula One racing cars; from the aqueducts of ancient Rome to 1,600°C heat shields on the space shuttle, ceramic’s extreme versatility is complimented its incredible ability to shrug of time and adversity. 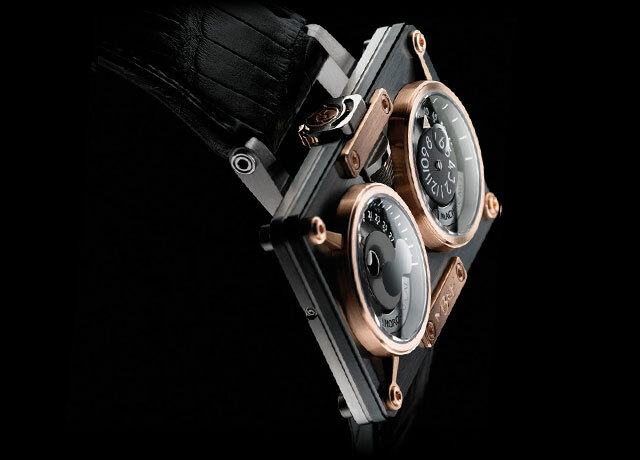 Like MB&F, ceramic effortlessly blends tradition with high-tech and engineering with art. The black ceramic on this new HM2 has a unique brushed satin finish - ceramic surfaces are generally high gloss – which imparts a silvery metallic sheen that is appropriately fitting for a horological machine par excellence. 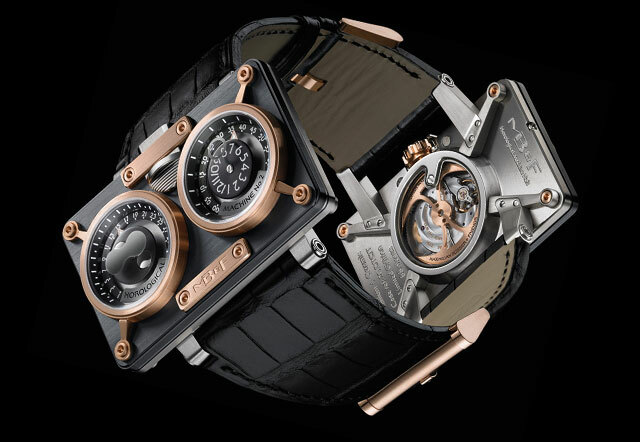 Two versions are available: ceramic with red gold (HM2-CR) and ceramic with titanium (HM2-CTi). And the exclusivity of HM2-Ceramic is ensured by the fact that the model will be limited to just 33 pieces in ceramic/red gold and 66 in ceramic/titanium. Last year I had crafted for myself a pair of gold cufflinks featuring our now iconic MB&F battle-axe rotor to compliment the Horological Machines on my wrist. Then, during my travels around the world, more and more clients and friends began asking where they could get a pair. So this year we decided to launch the first of what we call our "Auxiliary Components". These will be works of artisanship or technology that will complement MB&F’s Horological Machines. The cufflinks are in 18k red gold or 18k white gold and feature black mother-of-pearl on which is displayed an 18k gold battle-axe. Both the red and white gold come in a small series of just 50 pieces. For more information, please contact one of our worldwide retail partners, or our head-office in Geneva. If you visit the In the Press on our website, you will discover over a hundred informative and interesting articles on MB&F from all over the world. A search function allows you to select by topic, country and language. 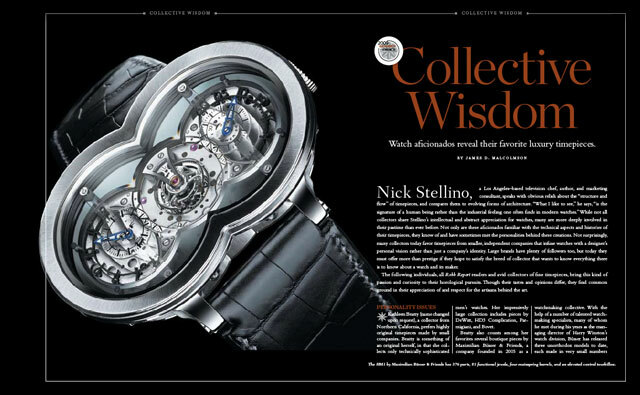 In this wonderful article by James D. Malcolmson in the Robb Report (January 2009) for example, there are interviews with enthusiastic and knowledgeable watch collectors about their favourite timepieces – and guess which watch opens the article! In this world of pasteurized and sanitized pre-packaged goods and information, there are still people and topics out there that stand out from the ordinary. In A Parallel World we search out subjects that catch our eye, make us think, bring a smile, and we share them with you. This week A Parallel World features the giant robotic animal machines of Nantes, France. In the challenging year ahead, intrinsic quality, true artisanship and real innovation should count for more than ever, so let us continue to be amazed and celebrate the creations of incredible artists and artisans the world over. Please allow me therefore to finish with the French expression, "En route pour de nouvelles aventures! ", which loosely translates as "Let’s buckle up for a whole series of new adventures!"